When you display a large number of items in a scrollable list, most of the items aren&apos;t visible. For example, in a long list of words or news headlines, the user only sees a few items at a time. Or you may have a dataset that changes as the user interacts with it. If you create a new View every time the data changes, that&apos;s a lot of View items, even for a small dataset. To conserve memory, minimize the number of View items that exist at any given point. To save time, minimize the number of View items you have to create. To accomplish both these goals, create more View items than the user can see on the screen and cache the created View items. Then reuse the View items with different data as list items scroll in and out of the display. The RecyclerView class is a more advanced and flexible version of ListView. It&apos;s a container for displaying large, scrollable data sets efficiently by maintaining a limited number of View items. Use RecyclerView when you need to display a large amount of scrollable data, or data collections whose elements change at runtime based on user action or network events. A RecyclerView. The scrolling list that contains the list items. An instance of RecyclerView as defined in the Activity layout file to act as the container for the View items. Layout for one item of data. All list items look the same, so you can use the same layout for all of them. The item layout has to be created separately from the Activity layout, so that one View item at a time can be created and filled with data. A layout manager. The layout manager handles the organization (layout) of user interface components in a View. Each ViewGroup has a layout manager. 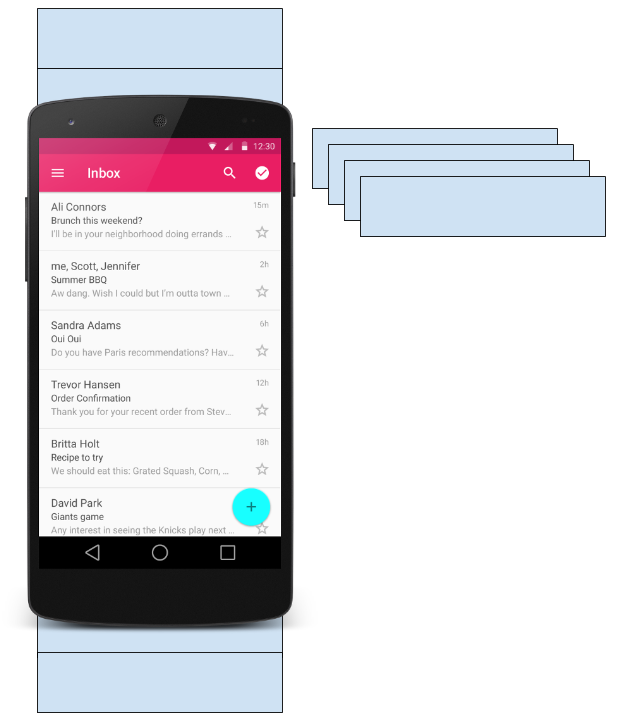 For LinearLayout, the Android system handles the layout for you. RecyclerView requires an explicit layout manager to manage the arrangement of list items contained within it. This layout could be vertical, horizontal, or a grid. The layout manager is an instance of Recyclerview.LayoutManager to organize the layout of the items in the RecyclerView. An adapter. Use an extension of RecyclerView.Adapter to connect your data to the RecyclerView. It prepares the data and how will be displayed in a ViewHolder. When the data changes, the adapter updates the contents of the respective list item view in the RecyclerView. A ViewHolder. Use an extension of RecyclerView.ViewHolder to contain the information for displaying one View item using the item&apos;s layout. The diagram below shows the relationship between these components. A RecyclerView is a ViewGroup for a scrollable container. It is Ideal for long lists of similar items. A RecyclerView uses a limited number of View items that are reused when they go off-screen. This saves memory and makes it faster to update list items as the user scrolls through data, because it is not necessary to create a new View for every item that appears. In general, the RecyclerView keeps as many View items as can fit on the screen, plus a few extra at each end of the list to make sure that scrolling is fast and smooth. The layout for a list item is kept in a separate XML layout file so that the adapter can create View items and edit their contents independently from the layout of the Activity. A layout manager positions View items inside a ViewGroup, such as the RecyclerView, and determines when to reuse View items that are no longer visible to the user. To reuse (or recycle) a View, a layout manager may ask the adapter to replace the contents of the View with a different element from the dataset. Recycling View items in this manner improves performance by avoiding the creation of unnecessary View items or performing expensive findViewById() lookups. An adapter helps two incompatible interfaces to work together. In a RecyclerView, the adapter connects data with View items. It acts as an intermediary between the data and the View. The adapter receives or retrieves the data, does any work required to make it displayable in a View, and places the data in a View. For example, the adapter may receive data from a database as a Cursor object, extract the the word and its definition, convert them to strings, and place the strings in a View item that has two TextView elements—one for the word and one for the definition. You will learn more about cursors in a later chapter. onCreateViewHolder() inflates a View item and returns a new ViewHolder that contains it. This method is called when the RecyclerView needs a new ViewHolder to represent an item. onBindViewHolder() sets the contents of a View item at a given position in the RecyclerView. This is called by the RecyclerView, for example, when a new View item scrolls onto the screen. A RecyclerView.ViewHolder describes a View item and metadata about its place within the RecyclerView. Each ViewHolder holds one set of data. The adapter adds data to each ViewHolder for the layout manager to display. You define your ViewHolder layout in an XML resource file. It can contain (almost) any type of View, including clickable elements. Add the RecyclerView dependency if needed (depending on which template is used for the Activity). Add the RecyclerView to the Activity layout. Create a layout XML file for one View item. Extend RecyclerView.Adapter and implement the onCreateViewHolder() and onBindViewHolder() methods. Extend RecyclerView.ViewHolder to create a ViewHolder for your item layout. You can add click behavior by overriding the onClick() method. In the Activity, inside the onCreate() method, create a RecyclerView and initialize it with the adapter and a layout manager. 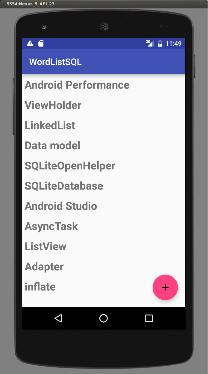 The RecyclerView library (android.support.v7.widget.RecyclerView) is part of the Support Library. Some Activity templates, such as the Basic Activity template, already include the Support Library dependency in the app&apos;s build.gradle (Module: app) file. If Android Studio highlights the above dependency and suggests a newer version, enter the version numbers for the newer version. Use the RecyclerView from the Support Library (android.support.v7.widget.RecyclerView) to be compatible with older versions of Android. The only required attributes are the id, the layout_width, and the layout_height. For customizing with more attributes, add the attributes to the items, not to this RecyclerView, which is a ViewGroup. Create an XML resource file and specify the layout of one item. The adapter uses this code to create the ViewHolder. Right-click (or Control-click) the TextView. Choose Refactor > Extract > Style. Name your style, leave all other options selected, and select the Launch &apos;Use Style Where Possible&apos; option. Then click OK. When prompted, apply the style to the Whole Project. You learn more about styles in another lesson. In the constructor, get an inflater from the current context, and your data. onBindViewHolder() associates the data with the ViewHolder for a given position in the RecyclerView. The ViewHolder class for your item layout is usually defined as an inner class to the adapter. Extend RecyclerView.ViewHolder to create the ViewHolder. You can add click behavior by overriding the onClick()method. If you want to add click handling, you need to implement View.onClickListener. One way to do this is to have the ViewHolder implement the View.onClickListener methods. // Extend the signature of WordViewHolder to implement a click listener. In its constructor, the ViewHolder has to inflate its layout, associate with its adapter, and, if applicable, set a click listener. And, if you implementing View.onClickListener, you also have to implement onClick(). If you want to attach click listeners to other elements of the ViewHolder, do that dynamically in onBindViewHolder() (you will do this in another practical). Connect the adapter with the RecyclerView. Give the RecyclerView a default layout manager. RecyclerView is an efficient way to display scrolling list data. It uses the adapter pattern to connect data with list item views. To implement a RecyclerView, you need to create an adapter and a ViewHolder. You also need to create the methods that take the data and add it to the list items. The related practical is 4.5: RecyclerView.